Have you noticed our new road sign, at 1123 Flinders Highway, Port Lincoln? We’re very pleased with it, but it took months to come to fruition. Linda took on the project, liaising with various local authorities before we were finally granted permission for it to be erected. It’s not just a matter of deciding to put up a new sign – there’s a lot involved. For instance,initially an application needed to be made to the District Council. Then an engineers’ report was required. This was to ensure that the sign complied with all relevant safety features and would not be hazardous to motorists. Our local Port Lincoln business, Impact Signs, interpeted our needs perfectly, doing all the work, including removal of the old sign. So what was wrong with the old sign? you may ask. We wondered too initially. The previous sign had been there many years, in the same position as the new one. Yet we came to the realisation that a more contemporary ‘feel’ was needed. Complacency can’t be contemplated when running a business – there’s always room for improvement. An awareness of changing trends and public perceptions is important too. For instance, when the old sign was created years ago, it announced “office, chapel and garden” underneath our name. 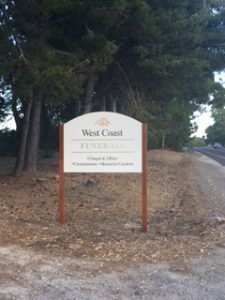 We’d already established our crematorium on our property, but somehow – back then – it seemed distasteful to add that to the sign. So it was not mentioned and unless people came to our premises, many were unaware of the facility we’d established. Until the latter decades of the twentieth century, discussions surrounding death and dying were largely taboo. But because of increasing media influence, there’s now a much greater social acceptability surrounding death. More open expressions regarding the topic have slowly changed the way we view this part of life. The veil of mystery has been lifted. Hence, while the sleek new sign has less wording than the old one, it now displays “Chapel and office, crematorium, and memorial gardens”.